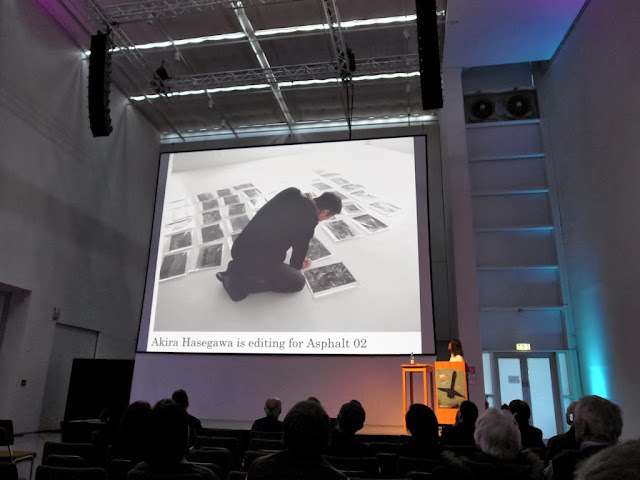 This year's sixth edition of the FotoBookFestival in Kassel, Germany was dedicated to the complete body of photobooks published by Japan's arguably most prominent living photographer Moriyama Daidō (b. 1938, Ikeda, Ōsaka Prefecture). For this purpose, the organizers brought together for the first time ever all of the artist's books published since 1968 in a large installation entitled Daido Book Show. 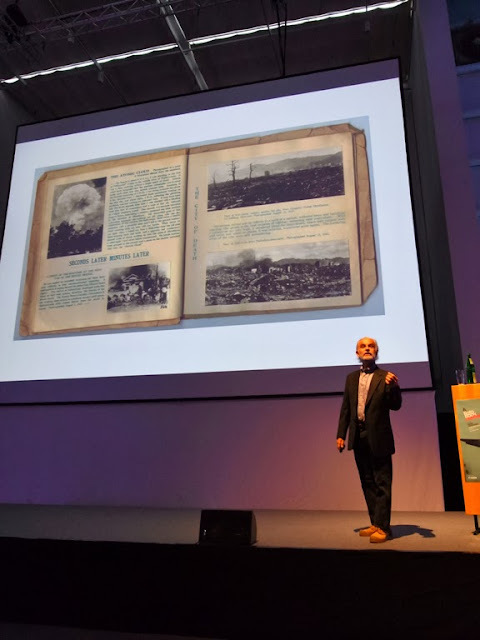 Except for a small number of rare and out-of-print titles that were available as facsimiles, most of the exhibited books were originals. Nevertheless, the visitors were allowed to leaf through the pages of each publication as they desired. Thanks to this unique opportunity, the installation provided a much more genuine experience of Moriyama's work as a photographer and book maker than any exhibition of his prints would have been able to do. For that reason alone, the Daido Book Show was a convincing curatorial undertaking. First room of the Daido Moriyama Books 1968-2013. 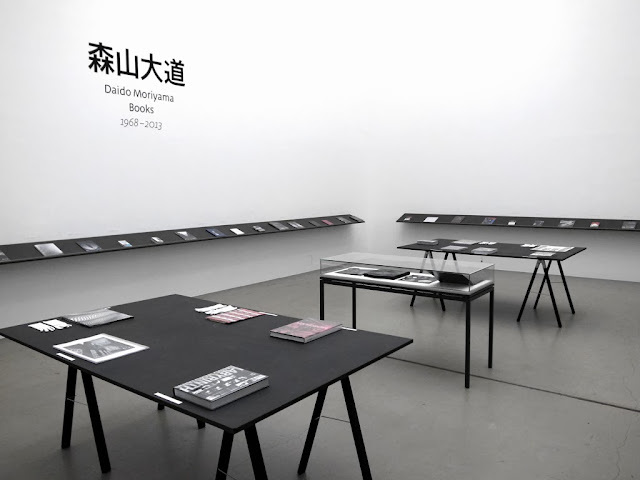 Third room of the Daido Moriyama Books 1968-2013. 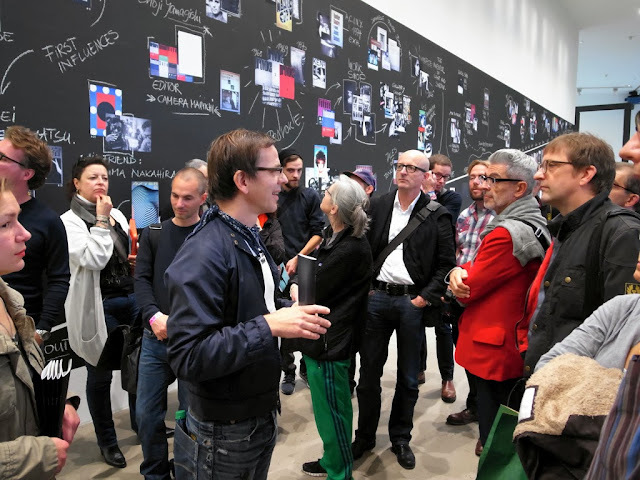 Another integral part of the festival's program was Markus Schaden's guided PhotoBookStudies # The Daido Books, curated by Cäcilia Zöller and summarized in the small staple-bound publication TELEX DAIDO. 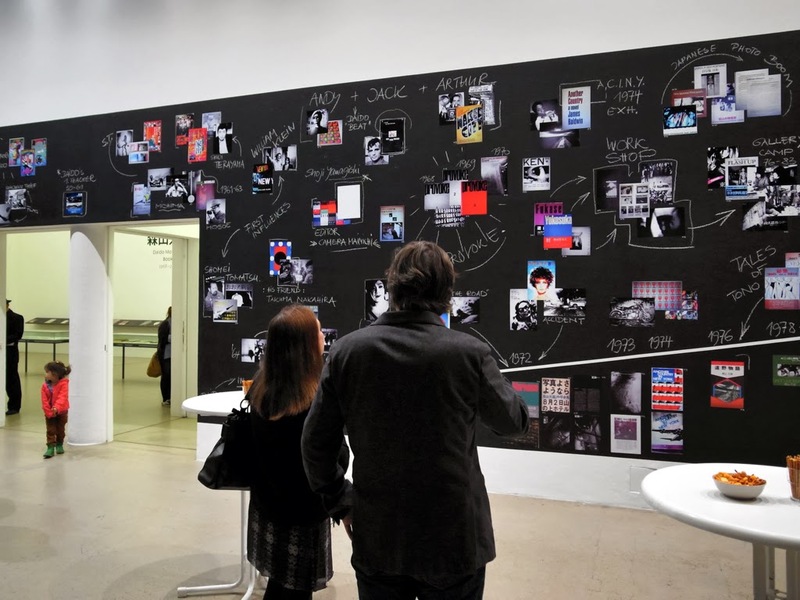 Using a wall of the documenta hall's first floor as their work surface, the two created a visually catchy and conclusive timeline/mind map that illustrated Moriyama's long-lasting book making career in relation to important artistic and personal influences such as the works of Mishima Yukio (1925-1970), Tōmatsu Shōmei (1930-2012), William Klein (b.1928), Jack Kerouac (1922-1969), Yamagishi Shōji (1930-1972), Nakahira Takuma (b. 1938) or even Joseph Nicéphore Niépce (1765-1833). PhotoBookStudies # The Daido Books. Markus Schaden and Cäcilia Zöller. In addition to the screenings of several documentaries including Nakahira in Osaka 2013 by Osamu Kanemura (b. 1964) or the insightful Near Equal, Daido Moriyama, released in Japan in 2002, a number of short lectures and panel discussions were held regularly from Friday to Sunday. Unfortunately, not all of the keynote speakers were up for the task. The evident lack of Japanese language skills repeatedly seemed to prohibit Western scholars, publishers or curators from looking beyond the already established catalog of names and book titles. Not necessarily satisfying, if you consider the professional context in which these presentations were held. Fortunately, there were also several exciting and informative presentations that all the more need to be mentioned here briefly, e.g. Mark Pearson's (Zen Foto Gallery) talk about his latest exciting project ShaShaSha, Fujiwara Atsushi's insight into the working methods of the editor Hasegawa Akira (b. 1949), Simon Baker's analysis of Moriyama's photographic practice in regard to the Surrealists and the general question of what it means to photograph in the city, or Ferdinand Brüggemann's (Priska Pasquer) notes on recents developments in contemporary Japanese photography since the tsunami and Fukushima Power Plant catastrophe in March 2011. John Gossage on Japanese protest books from his private collection. Fujiwara Atsushi talks about the editor Hasegawa Akira. 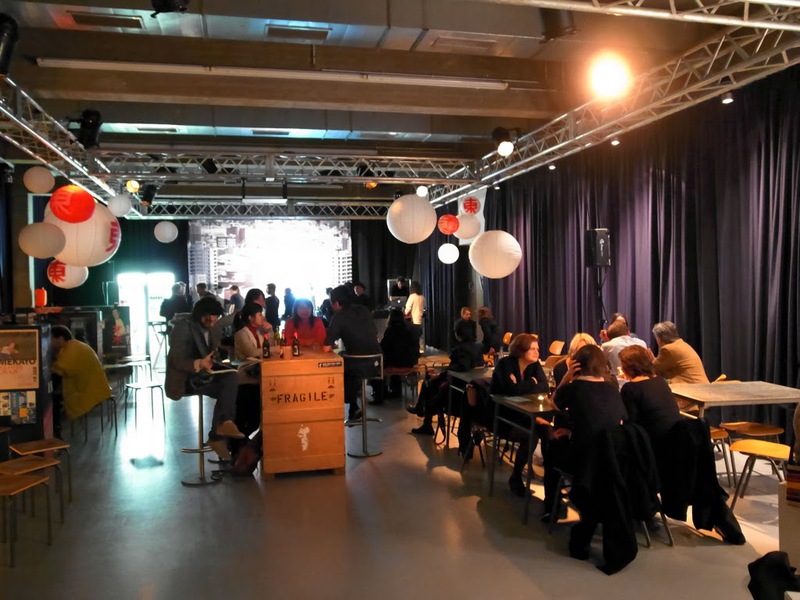 Ever since Ivan Vartanian organized the PRINTING SHOW-TKY event in 2011 together with Aperture in New York (a restaging of Moriyama's legendary 1974 exhibtion Printing Show*), a few institutions such as Tate Modern held similar printing events in the last couple of years. The 2013 FotoBookFestival followed this trend and produced a selection of large-format posters with images from the 2006 publication It as well as the Light & Shadow Magazine. The latter is made up of 12 double-page spreads taken from Moriyama's 1982 publication Hikari to Kage (Light & Shadow). 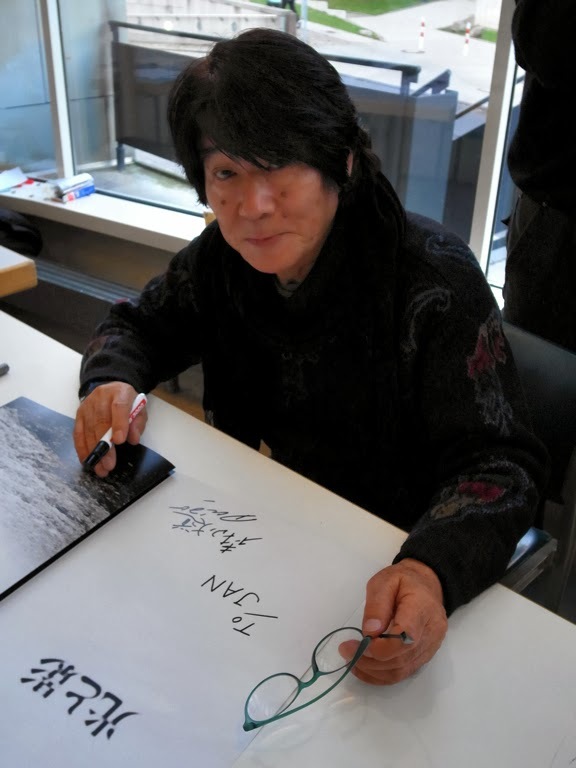 Each copy can be reassembled by its owner and was individually signed during the event by Moriyama Daidō himself. 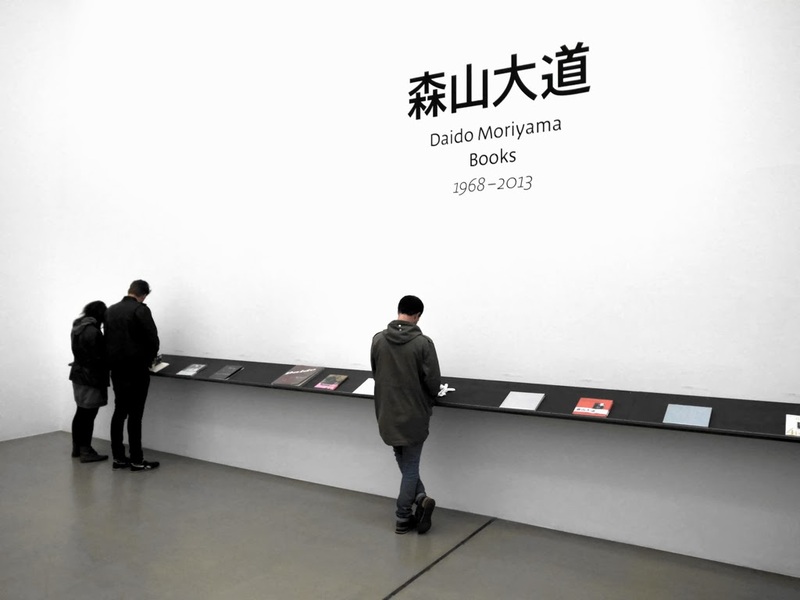 A catalog entitled On Daido, featuring short rendering essays by other photographers and critics on the festival's guest of honor, was also published. Moriyama Daidō after signing a copy of the Light & Shadow Magazine . on the ground floor of the documenta hall. * In 1974, during an exhibition entitled Printing Show, Moriyama self-produced one of his by now most-sought-after publications Another Country in New York. Equipped only with a copy machine and a silk screen printing station that allowed him to produce two selectable covers, he took the book making process onto the premise of the gallery's exhibition space and thereby changed the way photography was produced, distributed and viewed at the time.